“Mein Herz das ist ein Bienenhaus, die Mädchen darin das sind die Bienen. Sie fliegen ein, sie fliegen aus, gerad wie in einem Bienenhaus. (My heart is a beehive, and the girls in it are the bees. Text is from the first verse of an unattributed German folk song. 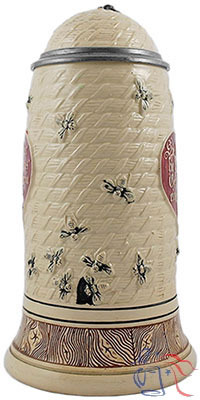 Although artificial bell-shaped basket weave beehives have been largely replaced by more efficient box-type hives that can be inspected and harvested without disturbing the bees, they are still in use some regions, particularly in Europe. 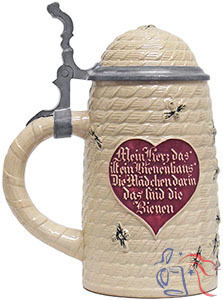 Interestingly, versions of this stein produced after the original were comparable in every respect except for the number of bees. The original had twenty-one, but that number was reduced over time. 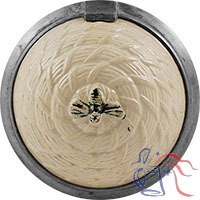 Note, for instance, the slightly differing bee pattern between the example at the right and the one shown below center. In the post-WWII era, a completely restyled stoneware version of this stein was introduced (not shown) that is easily distinguishable from its prewar counterparts based on both coloring and configuration.